Note for 2019: Rust-Oleum bought Synta Deck Restore in 2012. It is now called Rust-Oleum Deck Restore. Deck Restore™ is the smart alternative to deck replacement. It revives and protects wood surfaces such as wood and composite decking, stairs, docks and more. Deck Restore™ is water based, low odor and fills up to 1/4” cracks. Synta’s Deck Restore is designed to “mask” the wood. It will not show the wood grain. Promoted as a product for wood that is beyond conventional restoration. – Synta Restore is basically a very thick paint that is designed to mask the wood and fill any large cracks and voids. To us it looked very fake on the pressure treated deck. We also noticed that the finish (after full drying) is very hot to the touch when exposed to direct sunlight. To the point that you would not be able to walk on the surface with bare feet. – Being a solid non-translucent product, the (Rust-Oleum) Restore does not show any signs of UV fading. This is normal for solid stains and paints. – Synta (Rust-Oleum) Restore showed some wearing in the high traffic areas and between the decking boards. It seems that the (Rust-Oleum) Restore did not adhere to the boards as the finish curled up here. – Horrible. We needed 10 of the (Rust-Oleum) Restore 2 gallon kits. That is $600 for a 600 sq. foot deck or $1 per foot. – Synta (Rust-Oleum) Restore should zero mold or algae on deck. – Very difficult to apply. We used the supplied roller and a heavy duty brush for back wiping and to get between the floorboards. We followed all the supplied directions. The entire project for the two required coats took 12 hours to perform with 2 people. We had issues getting the stain to apply evenly and between the deck boards. Full curing for the Synta Restore can take up to 3 weeks. – Did not darken or attract dirt. – Heavy scraping to remove the peeling stain would be required prior to applying another coat. Conversations with the manufacturer on product failure were difficult. Basically, they blamed the peeling on poor prepping of the wood even though we followed their online instructions. – We are not a fan of this product. Basically, a “thick” paint that performs about the same as any other solid color deck stain. Doing some research online and you will find there are more unhappy customers out there than satisfied customers. Appearance is poor, the application is difficult, and the cost per foot is horrible. To be fair, the Synta Restore did score extremely well in UV fading and preventing mold. Coverage Per Gallon: 100 sq. ft per 2-gallon kit for 1 coat. Need 2 coats for best performance. Please read our article on Gulf Synthetics Deck Revive Review 2019 We believe this product has real value if looking for these product types that actually work. That is because they changed the formula. I purchased this crap ( not knowing it was crap) in 9/30/2012. Cost $143.71 which included everything I needed. After the first year I noticed peeling and it was not comfortable to walk on with your bare feet. The years went by and I was so happy I didn’t put this crap on my entire deck (675 sq ft). I had spent hours removing this junk with a sharpened flat shovel, a very expensive $165.00 angle grinder, approximately eight 7” wire wheels (which would ware down to nothing), ten plus 7” and 4” sanding disks, a 7”and 4” diamond grinding wheel (used for concrete and paint coating removal), plus hour after hour for weeks on my knees. Total cost in materials and including my time figure $1800.00 or more. If I had a contractor complete the same it would have cost $3000. The funny thing is the deck is very close to the house and trees or I would have used about five gallons of gasoline and it would taken less time and material. I will say only one more thing about this crap. DON’T USE IT EVER!!!! The people that came up with it should be forced to pay to have it removed from your deck. I used this product (from Synta) in 2012 before they were purchased by Rustoleum. I have never used a better or longer lasting product ever. It wears like iron and looks great 6 years later. It makes me wonder if Rustoleum altered the original formula. Wish I could get another gallon of the Synta produce for touch ups. I am currently in the process of completely stripping off the Restore product after having it on the deck for four years. Each year more and more of the product would peel off during power washing and I essentially had to patch and over paint more of the deck each year. This year sheets of the product peeled like a Post It note and I decided to remove it completely. Unfortunately, some of the product did adhere as it was supposed to and I am literally having to chip those areas off with a chisel. So far it has taken me four days and I am still not done. Unfortunately there is also some damage to the decking because of the chiseling and I will be forced to completely sand the entire deck down to try and recover it. Horrible product. We bought Restore to do our large deck in 2012. It was supposed to protect our wood deck and last for years. It has been a nightmare! It looks terrible and is totally coming off. My husband spent hours preparing the deck before applying Restore. Added a second coat like recommended. We are just sick about how our deck looks. Now we are faced repairing it and spending money we don’t have. My husbands health has failed and he can not do all the work it is going to take to restore it. This is unacceptable. Is this company going to stand by their claim that it lasts for years? I am in the process of removing this crap from my deck. It lasted maybe a year and then started peeling and flaking off. Very disappointed. I totally regret putting this on my deck. 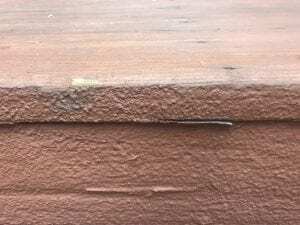 It is peeling in sections and has adversely impacted water drainage between the boards. The worst part is I can't find anyone who will remove the product. 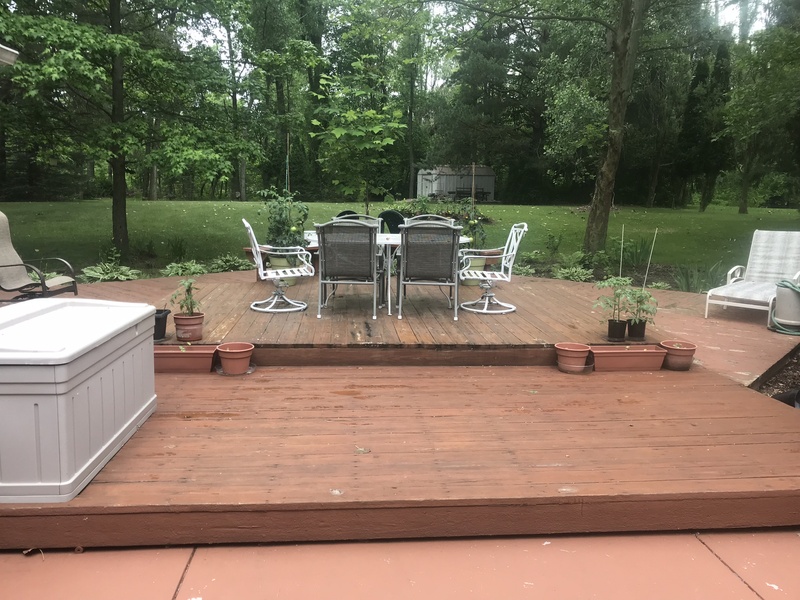 I've had several different contractors/deck companies come out and look at the deck, and all of them just shake their heads and tell me that they've seen so many other decks like mine and that the product is one of the worst things that you can put on a deck. i am so disgusted with your product. it absolutely DID NOT do the job I was led to believe it would. applying it was difficult enough but to have to patch it up every year is absolutely ridiculous. right now it is peeling off in big chunks. absolutely worthless and paid probably $700.00 or more to do my decks. this may not seem like much to you but you are probably not on a limited income and as old as I am. I thought I was using something that would make things easier at my age but that certainly wasn't the case. I wouldn't recommend this product to anyone. shame on you for putting such a product on the market and misleading the customers and taking their money without a second glance. I put on front deck 5 or 6 years ago and only did a coat and then touch up. Looked great. Held up 2 years looking like it did when I put on. After about 4 years started to look a little chipped on edges. But not bad. Recoated this year using deck start which is easy on then reapplied with lighter color. Looks great. Just finished back decks. First time was massive project for my 16 year old deck. Filling cracks and now 3 coats but solid and looks awesome. The only reason I gave it one star is because that was the lowest it would go. They need to take this mess off the market! This product looked good at first followed directions and applied after first year started to notice cracks in the product on the deck boards. Second year I now have the product peeling off the boards in strips. My deck is 52’x32″ spent a small fortune and a lot of hard work prepping the surface and applying the product. Like I stated above. It looked great the first year now starting to have problems. Not sure on what to do but not satisfied with what product had promised to do. We used the 10x on our deck last summer. Prepped and followed all instructions to a t. This summer it is peeling off in thick strips right down to the bare wood. So disappointed and it's sickening to think of the money we spent. Did the slats and handrails in the 4x. Same results. Stay away from this product. Not worth the money or time. This stuff ruined our whole deck ?????? HAS ANYONE TRIED TO REMOVE THIS CRAP? My deck after 3 months looks like hell.Can you tell me how to remove? sanding? Sanding but make sure you wear a mask. Overall I am happy with the product. It does get a bit hotter than we expected with the relatively light color "Beach." it was a good alternative to reboarding. We have had it on for 5 years and have re-coated damage areas twice. The left over paint is still viable after years in storage. It is not perfect, but has exceeded my expectations. It is much better than the deteriorated porch/floor paint that was on the deck when we bought the house. My experience as well still looks good just a peel here and there what did you use to touch up those spots . Product applied three years ago. It is not easy to apply. Unhappy with look of product after application. We applied color "BEACH". Stains horribly. It a very porous, making it impossible as far as cleaning GA red mud stains. CONTACTED SYNTA and they agreed to send stain of another color. They sent 4 gallons. Which covered 1/3 of surface we had applied originally. The darker stained area faded quickly, anyway. The following summer we began to signs of bubbling and peeling of the product. What a mess. This year we have 6 boards that are rotten almost all the way through. We applied to brand new decking. 1400 sq feet of new decking. This product is not at all suitable for restoring or protecting a deck from any type of weather, serves as no protection from elements or moisture. Unhappy since day one and feel the product is responsible for rotten boards we have. Decking on its on will last longer than 3 years. DO NOT RECOMMEND THIS PRODUCT. My husband applied this to our deck several years ago (I believe 5 or 6 years ago) and we are so in love with this product. There are a few places that might need some touching up but we use our deck so much I consider it just wear and tear. It was work to apply it but even now I am so impressed with this product. Maybe those who are complaining just didn't apply it correctly!!! SO IN LOVE WITH RESTORE!!!!! We have also used this product. Used it 2 years ago. Paint is chipping and peeling off our large deck as well. Lifetime warranty? Where do I go to apply for compensation? I contacted rust oleum directly with pics and all. They of course are saying we didn't prep properly but they are full of it! We did and we had to use more of it then suggested! I had no receipts so they sent me more stuff that is supposed to be better we shall see. We are in the horror of trying to get it all off now. Good luck to you! There is a class action suit but not one in Ohio as of yet. This product is misrepresented. We applied it as directed. After a few months the pressure treated decking that had been on there began to have rotten spots. The paint developed cracks and areas of dark dis colored areas. I am afraid we are going to have to replace the deck boards. 7 cans later and three years, my deck has mold and mildew and cracks.I want to be compensated for a grand waste of my money and time. 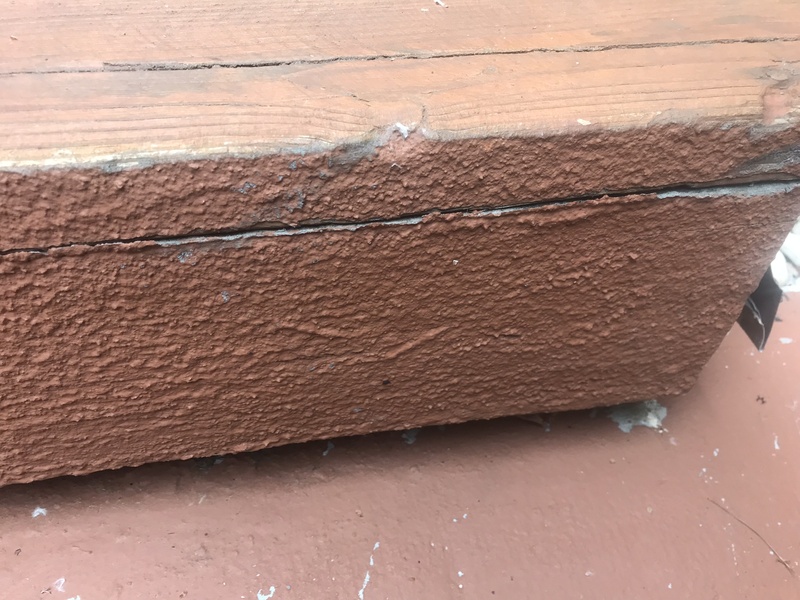 This product is very costly it is hard to apply after one year it had peeled off and I had to reapply the 2nd year it looks horrible my deck is 2800 sq ft so you can only amgine what it cost me to use this product. I am so dissatisfied. I would not recommend this product to anyone. We applied it 1 1/2 years ago and it is peeling off terrible. It looks worse then before we did it. We applied just as they said by power washing our deck, letting it dry for several days then rolling on the restore. It was difficult to use but am most disappointed by how it hasn't lasted. We should have just restrained our deck. We applied this product last fall as directed. This product did not make it 6 months before it started peeling. Our deck looks horrible and have spent the last 6 hours trying to remove this product so we can apply a regular stain. We have tried two different strippers, pressure washer and sanding. Difficult to apply, difficult to look at and difficult to remove. Would not recommend this product to anyone. This product is difficult to apply, but when you think it will last 10 years it is worth the effort. Then soon after applying, it begin to peel and crack and I will be lucky if it lasts three years. Not worth the expense and time – Buy something else. I used the restore and am I sorry. After one winter I am blowing strips of this product of the deck with my blower and broom. I followed the instructions very carefully to apply using the roller Home Depot recommended. DO NOT USE THIS PRODUCT! This is the biggest nightmare of my life! I painted deck 2 years ago. Last summer I had to repaint as it was peeling. Home Depot told me to not use a snow shovel or salt on the deck floor. I didn't have to. It peeled before winter. Now I'm trying to remove it. This is a joke – and not a funny one for the price! Of couse its not gonna last on stain..i hope the other people that had problems know this. It needs to sanded and powerwashed off. If not the stain will act as a barrier of moisture and over time it will come up..
We applied two coats of Rust-Oleum Restore 10X to our wood deck. It started bubbling and peeling after 1 month. We followed the directions very carefully. Now we have to strip the remaining product off our deck and reapply it. As far as we are concerned this is a faulty product and it should be pulled from the market. We complained to Rust-Oleum (Synta) and Rust-Oleum gave us a product replacement, but we are worried if we reapply the product it will bubble and peel off again. Has anyone reapplied the product after having it fail the first time and what has your experience been with the reapplication? It will just fail again. Horrible product! We applied again after the company sent us new product. Our deck is all rotted now with holes in it, and spongy in other places. We now have to replace our 900 sq. ft. deck because of this product….We called and they did refund our money, however, we now have to replace our whole deck. Not happy! They have a Class Action suit against them. I have been trying to contact the company and cannot seem to get a response. Yes and it failed much quicker second time and we followed instructions completely!! Started bubbling in less than 48 hrs and that was with primer and correct prep work! Complete garbage from rust-oleum. I used this product four years ago on my front deck when it was new to the market from Synta and that has held up great through these past north Ohio winters. Tried it again this last sumer on my back deck and after one winter I have giant patches peeling off! Can't figure out the difference other than rust-oleum found a way to screw up the formula and still sold it to unsuspecting customers! How do you screw up a great product? Eight buckets of this crap at $85 plus the cleaner and man hours cleaning and applying completely gone to waste! You will have to sand to remove or replace the wood as a stripper will not work and you cannot fix it by applying another stain on top. Disappointed in failure of stain after one year. Now will require additional work to remove peeling and blistered areas before reapplication. We purchased Restore in 2011 and it worked well, although it was very hot in the summer time. We purchased more in 2014; it was horrible. We've lost money and time. DO NOT PURCHASE RESTORE. Product deteriorates quickly, peels like a snake shedding its skin, is extremely hot in direct sun, cannot walk on it barefoot. Product is GARBAGE……. How do I remove this Restore crap!!! please help, does anyone know? So very disappointing…we applied this product to our deck last summer. It looked great, at first! After a rather harsh winter, it has bubbled and peeled. I contacted the company 6 weeks ago and have heard nothing from them. Truly a waste of time and money. 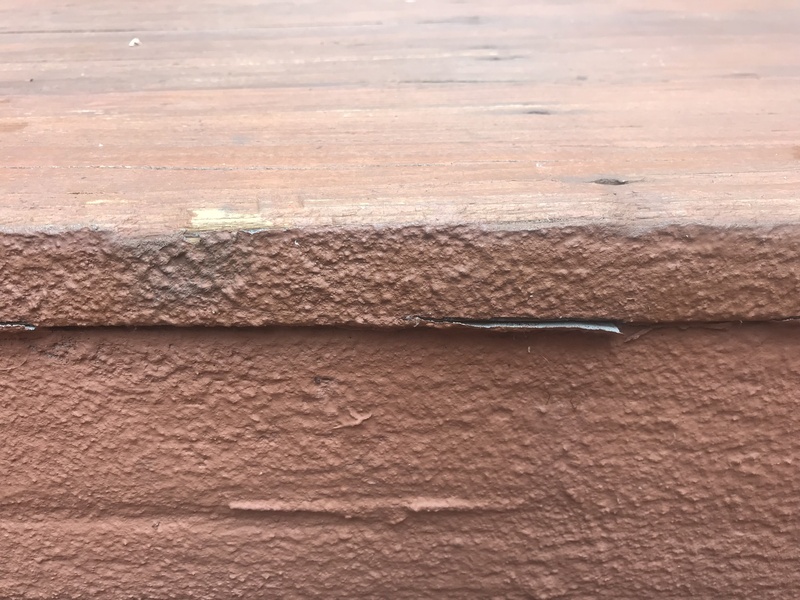 I did the same last fall and had the same results.the product 3 cracked on some of the boards and is chipping off I am very disappointed in this product I was hoping it would extend the life of my deck at least another 8 years. When I call the manufacturer they said the same thing they blamed it on poor Deck prep. Seems to be the answer from them I also know of another person that did theirs last year and there started chipping off before mine did. Synta was sold to Rust-Oleum last year I believe. Call them instead of Synta. My husband and I just spent the Memorial Day weekend using a rented sander to take Deck Restore off of our large wooden deck. I had followed the instructions to the letter when prepping the deck prior to application and went slowly while applying to ensure even coating, etc. Left all furniture off deck for several days to let the product dry well. Within a few weeks, it had already begun to peel off in spots, and if I used the hose to rinse dirt away, the product peeled up as though I was using a pressure washer. Unfortunately, we had also used it on our front concrete porch so are having to sand that as well since it peeled right up from that, too. Very disappointing and a LOT of work to remove as well as to apply. I would not recommend this product at all. me and my husband also did our patio of about 2000 square feet if not more in July of 2012. By next summer it had faded so bad as if it had been there for years and water stains that would not wash out. peeling on some ends. we contacted the company, e-mailed pictures. we spent over 2000.00 The company gave us a replacement of 1500.00. That was summer of 2013. Summer of 2014 the same thing. I'm going to contact the company again. For a full replacement. I would not recommend anyone to purchase this item. Like other complaints, I prepped and applied Restore exactly as the directions and video described – pressure washed, waited until completely dry and no threat of rain for at least 3 days after application. I also used more than the manufacturer said coverage should be. I had bought 5 – 4 gallon pails as well as the prescribed rollers. I finished the application in September of last year and by Christmas, saw the first signs of peeling. By April of this year, at least 1/4 of the deck has peeled, so I filed a warranty claim with Rustoleum. It has now been over a month since that claim and the only response that I have received so far was an acknowledgement that they had received my email attachments (Home Depot receipt and pictures of the peeling deck and stairs). This is by far, the worst stain/paint product that I have ever used and would advise everyone to save their money and TIME. Am now considering legal action and will definitely post more negative reviews and complaints online. Can't understand how a reputable company like Rustoleum can continue to sell this junk. Put this product on my deck August 2013. Fast forward to Feb 2014 and my deck looks horrible. It didn't survive 1 New England winter. I installed this decking product on about 200 sf of old redwood deck along the front of or home. The deck was almost 40 years old and was cracked and dry and even rotted along the top quarter to half inch to many of the planks. This was a perfect example of salvage vs replacement. Since the decking boards run under a portion of the building, cost would be over $6-10,000 to replace. I applied the product to the horizontal planks after using the cleaner (i let the cans sit in the sun for several hours to warm up before application and it will apply just fine). There was an area that I had to fill in a half inch in about a 2 sf area. I was aware not to walk on it for some time. Talk about night and day. Our deck that needed to thrown away looks fantastic. Forget about color selection as this is always subjective. We just chose a very conservative brown to match the color of the cabin. The cabin is at 6400 ft in sierra ca and it has survived a winter freeze at 17 below zero. It still looks great. For sure this product was designed for my application. I cannot attest to the concrete application.